To everything, (turn turn turn) there is a season… and oh my, how quickly they change, indeed. Those long, hot sunny days spent on the river have come to pass – and for the time being, summer is for The Byrds. The days have grown ever shorter as an all too familiar chill arrives upon the evening breeze. While the autumn wind is indeed brisk, the changing of the season is filled with activities, tastes and experiences that are sure to warm the heart. Whether it’s celebrating the bounty of harvest-time or embarking on a spontaneous getaway with that special someone – the fall is unequivocally my favourite time of year. Hot aromatic cider, cozy sweaters, a crackling fire in the hearth – and of course, the unparalleled natural beauty of this captivating, if not brief moment in time. For the next chapter in our series, Heidi and I embarked on a quest for fall colours amid the breathtaking scenery of Thousand Islands National Park. 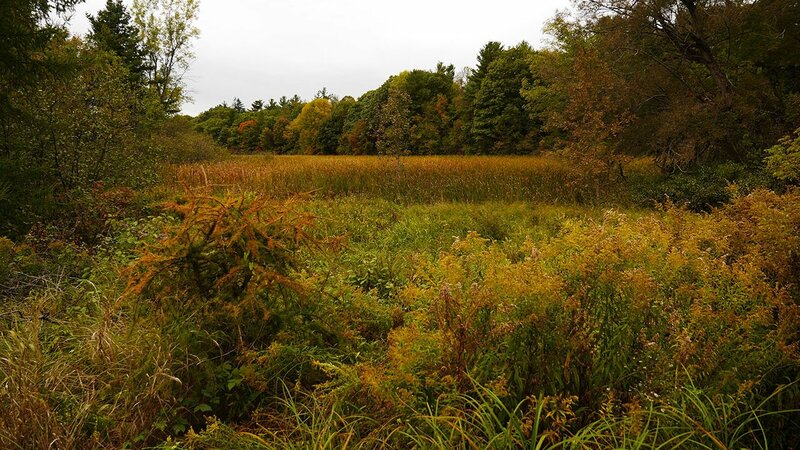 There we would explore some scenic hiking opportunities along the majestic St. Lawrence River and capture the essence of autumn while embracing the changing of the season with open arms. After a short, yet scenic drive along Highway 2 from Kingston to Downtown Gananoque we stopped in at Robeson’s Country General Store & Deli to take care of the most important meal of the day. Robeson’s is not just a fantastic place for a hearty meal but also a fascinating antiques and curios shop where you can find anything from vintage furniture, to collectibles and other nostalgic mementos of yesteryear. For breakfast, Heidi had the Breakfast Club Sandwich – a triple-decker monster containing fried egg, fresh tomato, bacon and a generous pile of ham as well as melted cheddar cheese. Yes, please! This brilliant breakfast sammie also came with a portion of delicious home-fried potatoes making it the perfect precursor to a day spent in the great outdoors. I chose the Loaded Omelette which is exactly like it sounds. Ham, bacon and sausage, onion and green pepper bound together with a generous amount melted cheddar and egg in what can only be described as the ultimate omelette experience. Paired with an order of toast and a generous pile of Robeson’s signature home-fries it was indeed a breakfast of champions. Situated only 10 minutes East of Gananoque is a rather enchanting outdoor area known as Landon Bay Centre. 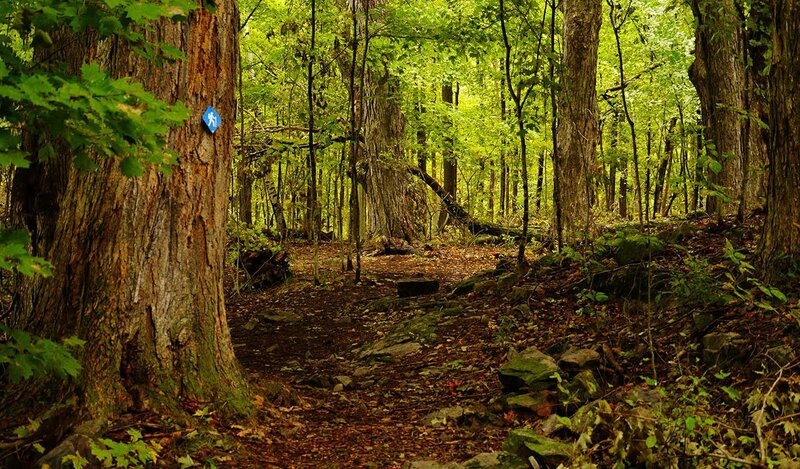 Operated by the Frontenac Arch Biosphere Foundation and invested in by Parks Canada, Landon Bay is a favourite outdoor space sporting six interconnecting hiking trails ranging in difficulty from easy to moderate. There was a modest amount of rain during the night before our trip, which had ended early in the morning. By the time we arrived at Landon Bay, the skies were still overcast, but this would only serve to enhance the visual atmosphere of the hiking trails. Heidi was especially excited because the lower light conditions would saturate the forest with an explosive and colourful illumination all its own. We began our journey on the Donevan Trail, which is difficult to miss thanks to the beautiful stone archway that marks the entry point. Lovingly crafted by hand, this evocative edifice is like something from a fairytale, welcoming all who pass beneath it to the enchanting forests and spellbinding pathways beyond. As we stepped beneath the forest canopy, we were instantaneously awestruck with the extraordinary amount of change already taking place all around us. While the verdant hues of summer still held fast, there was a growing presence of fiery oranges, reds and golden accents as the earliest signs of change spread throughout the forest’s interior. 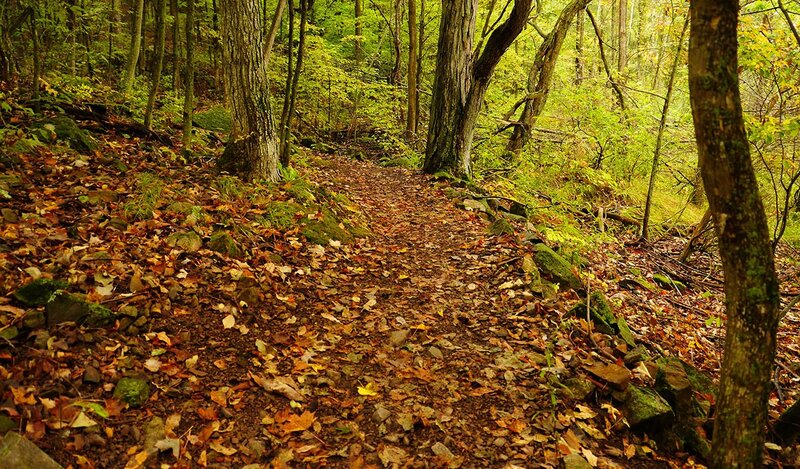 The sounds of our footfalls upon the trail were muffled by a carpet of leaves, some of which had already fallen from above while most were from the previous fall. It was an intriguing illustration of the simple yet reciprocal beauty of nature. From everything’s end – comes both the potential for and the promise of new life. We didn’t encounter much in the way of wildlife during our trek through Landon Bay. Perhaps the woodland creatures had opted to sleep in on this slightly wet and drizzly day. As we wandered along the trail, we did encounter Mister Toad himself (or perhaps his understudy) as he sat among a cluster of golden oak leaves enjoying a short break during his morning commute. After cautiously stepping around our amphibious little friend, we continued along the Donevan trail until we came across a set of yellow trail markers which indicated that we had found the Lookout Trail. More and more signs of autumn’s arrival began to reveal themselves at every turn. To assist hikers, there were a few staircases built into the trail as we ascended along our path. From the lookout point, we were treated to some stunning views of Landon Bay and the majestic St. Lawrence River embraced in a striking inferno of reds, oranges and golds as the radiant fall colours continued to spread throughout the surrounding area. As we stood staring out over this wonderful vista, it was hard to deny the raw beauty of nature’s design. These photos were taken at the very beginning of October. In a matter of weeks, these scenes will be awash in an explosion of autumn hues. 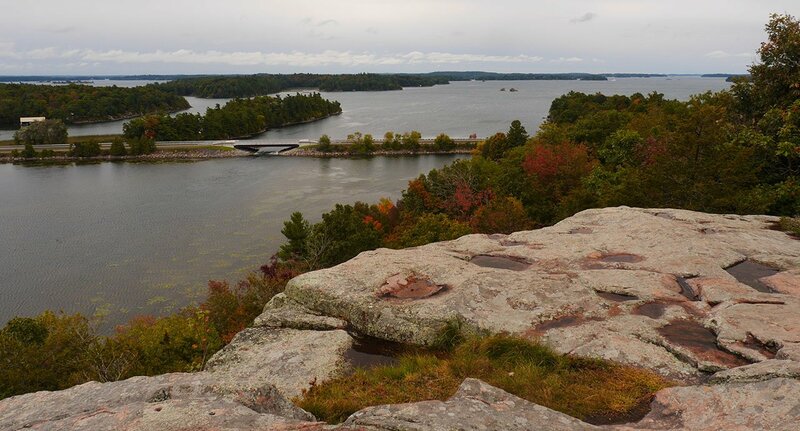 The time for a pleasant autumn hike in The 1000 Islands has never been better. 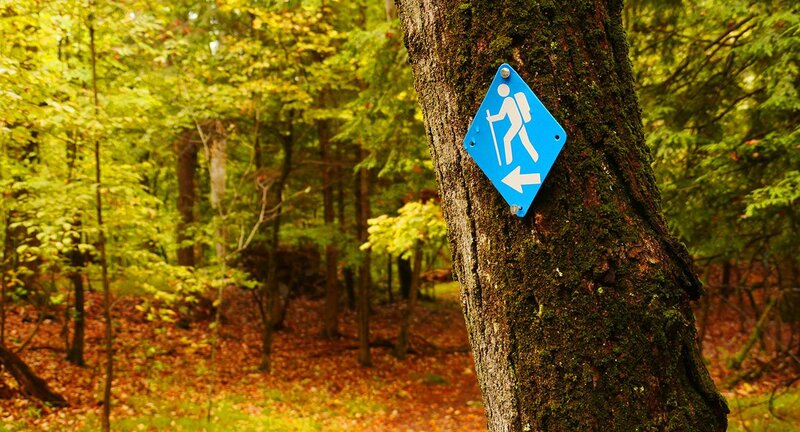 Landon Bay’s easy hiking trails are perfect for families – offering plenty to explore for all ages. After descending from the lookout point, we followed the trail back to the main road that cuts through the centre of the park. From there we crossed the open fields to explore the Garden Trail which also connects to the latter portion of the Donevan Trail, of which we had initially started. The Garden Trail was a fantastic visual feast that often felt as though we were walking through a mystical forested hedge-maze or forgotten road from the pages of Lewis Carroll, CS Lewis or JRR Tolkien. 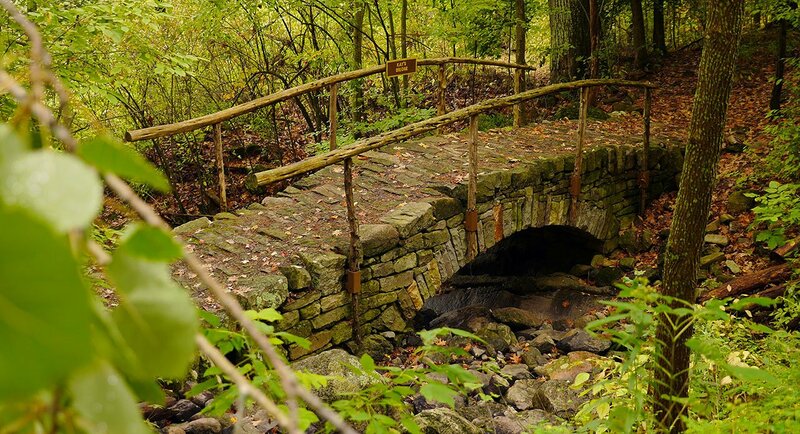 We followed the mystical pathway as it hugged the marshy banks of Halstead Creek until we came across Kay’s Bridge: a spectacular hand-laid dry stone construction allowing hikers to cross over the creek. At this point, we were all but certain that we had surely stumbled down a rabbit hole and ended up in Wonderland. 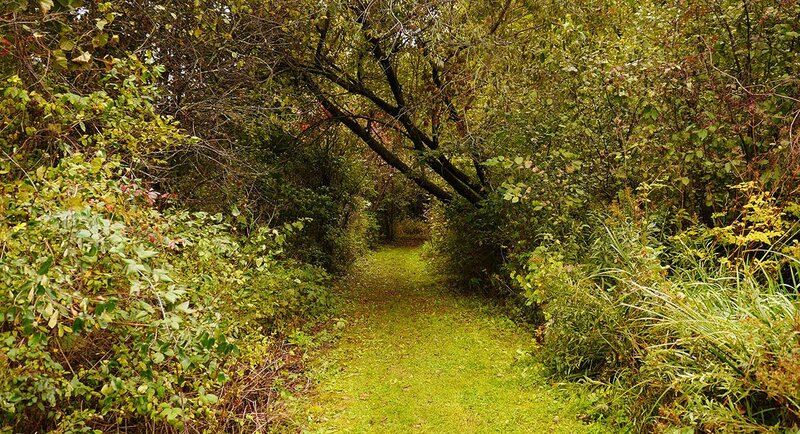 The trail resembled a brilliant emerald tunnel that seemed to go on forever, or perhaps to another realm that was far favourable to that of reality. It never ceases to amaze me, how a simple stroll through the woods can ignite one’s imagination in such vivid ways..
After pausing to appreciate and shoot photos of Kay’s Bridge, we doubled back onto the Garden Trail to complete our journey through Landon Bay. 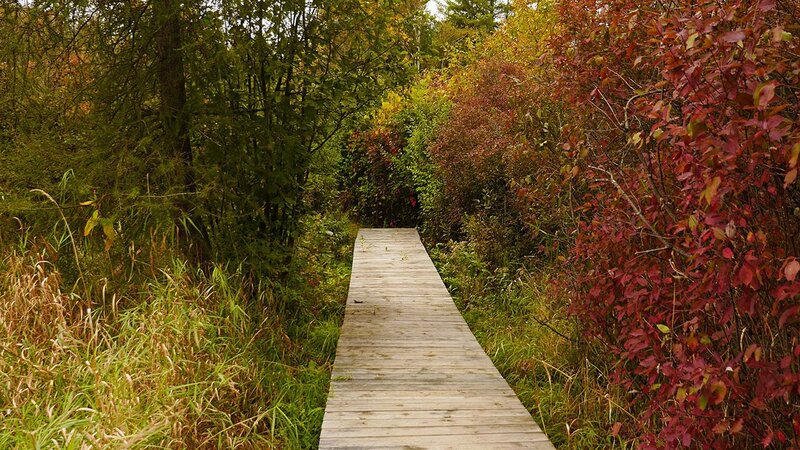 Although the weather was cold and mildly damp, there was plenty of splendid fall colours throughout the path which only added a certain warmth and seeming magic to the very air we breathed. As we got into the car and headed back to Gananoque, the rain had started to fall once again – as though the elements had politely waited for us to finish our hike. Our quest for signs of autumn had undoubtedly yielded some stellar results! 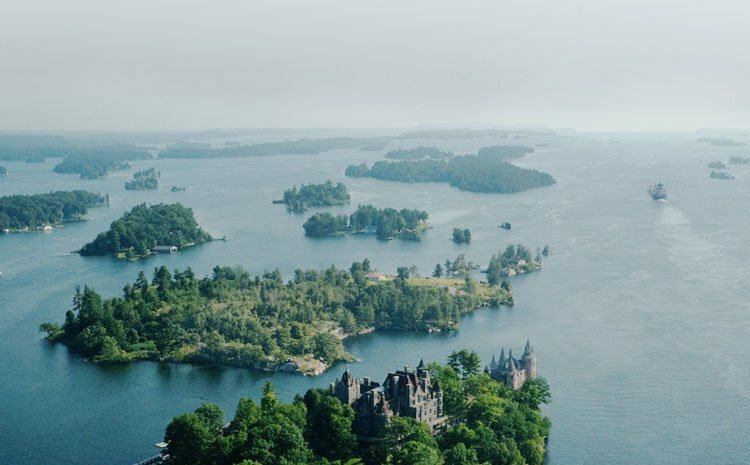 We spent nearly four hours exploring Landon Bay, and could have likely stayed for several more – but it was time to begin the next portion of our splendid 1000 Islands getaway! After a wonderful soak in the hot tub, we were content to relax in the comforts our room basking in the welcome warmth of the ensuite gas fireplace. There was a pair of cozy-looking armchairs strategically arranged next to the hearth, and they were just as comfortable as they appeared. The suite itself was elegantly furnished, with a simple yet practical layout. As we sat next to the fire reading and enjoying one another’s company, the chilliness of our long hike literally melted away. While there was a TV in the room, we couldn’t be pried away from our books, nor the intimate seating arrangement next to the fire. Time itself also seemed to melt away because before I knew it, it was time for our dinner reservation downstairs. By the time we sat down at our table we were absolutely famished. We had a hearty breakfast, but in the excitement of our outdoor adventure, we had inadvertently skipped out on lunch! Located in the lower level of the inn – Muskie Jakes is a Gananoque staple, and local favourite when it comes to delicious pub favourites, maritime-inspired food – and regularly scheduled performances by talented local musicians. 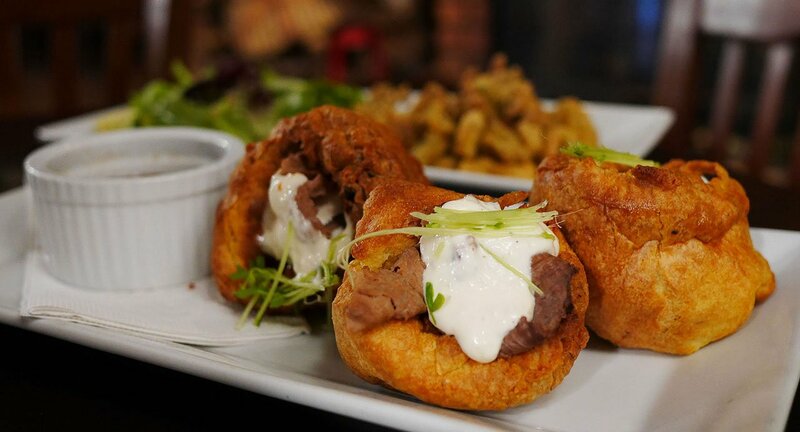 For starters, Heidi and I shared an order of Mini Beef Yorkie’s which is a trio of mini Yorkshire puddings stuffed with shaved roast beef and served with hot au jus and zesty horseradish aioli. 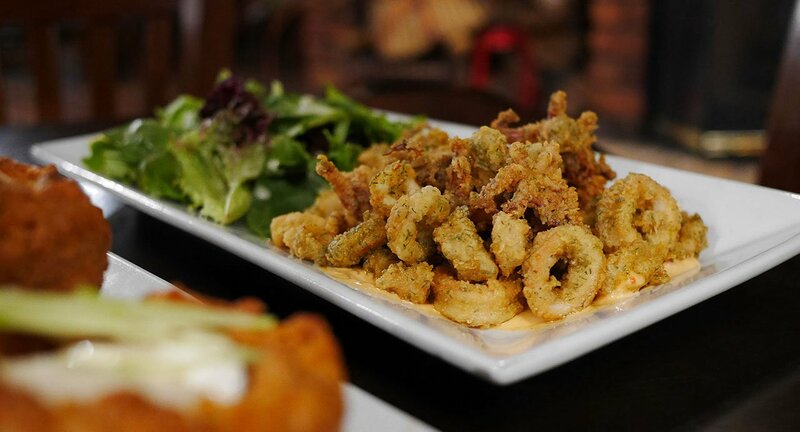 We also found it hard to resist the Crispy Calamari, comprising tender fried calamari lightly dusted within a tasty herb & spice breading and served atop a smoky and spicy chipotle aioli alongside a portion of fresh greens tossed with Muskie Jakes proprietary lemon dressing. For the main event, Heidi selected The Inn Burger. 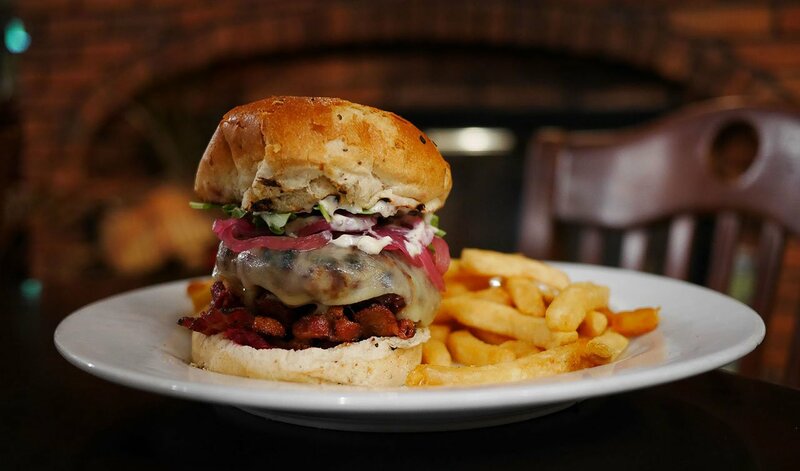 This glorious six-ounce beef burger was generously topped with a delicious aged white cheddar, pickled onions, mustard aioli, beet relish and fresh arugula. Heidi added bacon & mayo for good measure, resulting in a mind-blowing burger experience. From the photo-evidence below, I’m sure we can all agree that this is one of the most Instagram worthy burgers ever concocted. I absolutely love Mediterranean food and chose the day’s special: Chicken Souvlaki. 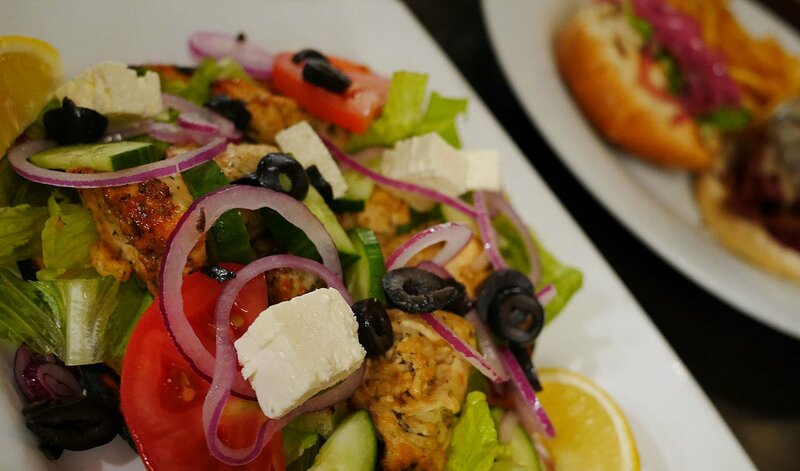 This sensational dish consisted of tender chunks of marinated chicken, fresh sliced tomato, red onion, crisp romaine lettuce, black olives huge pieces of feta cheese – all served on top of a grilled pita bread. The meat was succulent and flavourful, and the house-made souvlaki sauce that it came with was packed with a zesty garlic character that tasted like the best parts of tzatziki sauce and greek dressing rolled into one amazing taste. The result was a traditional Greek favourite that was more than suitable for the great Olympian dining halls of Zeus himself. After dinner, we returned to our room to relax for a while longer, but it wasn’t long before we were discussing the tantalizing dessert menu that we had looked over during dinner. That very evening, we descended the stairs and returned to Muskie Jakes once more to add a sweet ending to our day. A welcome fire was burning in the hearth as we sat down at the same table we had earlier. Along with some coffees, we each took turns sampling two different cheesecakes of which we found irresistible. 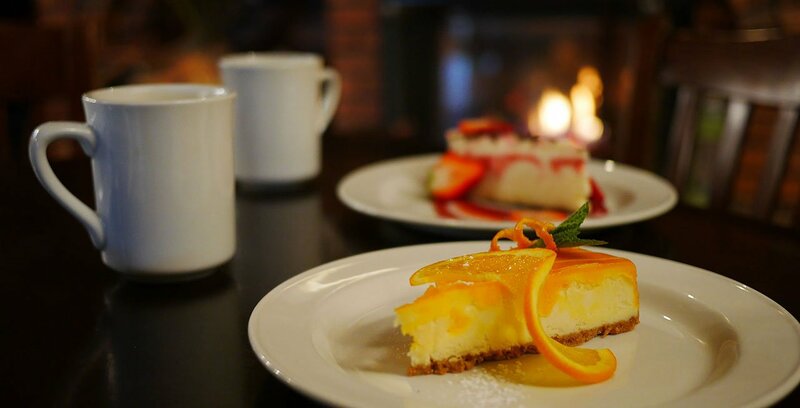 I quite enjoyed the orange cheesecake – which tasted like the very best elements of a Creamsicle alongside the rich, indulgent nature of cheesecake. Heidi was in love with the raspberry cheesecake which came topped with fresh strawberries and was as sinfully delicious as one would expect. I love how the desserts were presented, especially the orange cheesecake, which looked purely sublime with its spiral cut orange rind and sprig of fresh mint. Little touches make all the difference. With dessert finished, I thought we’d need a heavy-lift helicopter to get back to our suite, but we somehow found the energy to climb back up to the third floor by foot and retire for the night. Before climbing into that king-sized bed and enjoying a much deserved and exceptionally good night’s rest – we made sure to step out onto our suite’s balcony to enjoy a view of Gananoque’s beautiful waterfront after dark which was marvellous. Grey skies awaited us yet again as we awoke the next morning – but it did nothing to detract from the already gorgeous views of the waterfront from our room’s balcony. Before heading downstairs for breakfast, we sipped our coffees watching as the tour boats came and went from the harbour below. 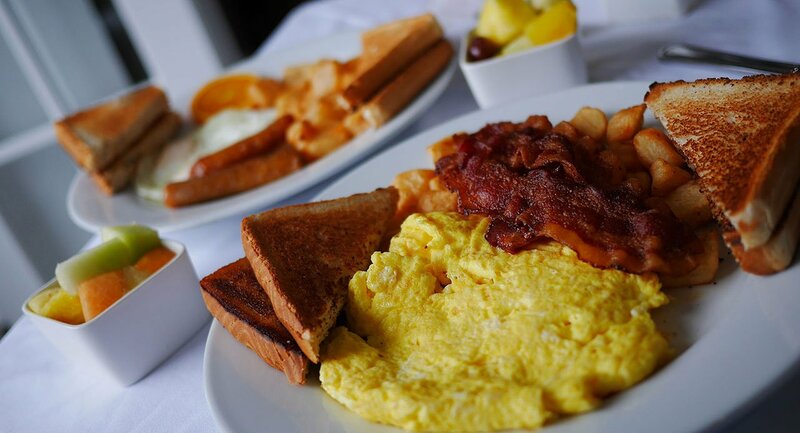 For breakfast, we’d be dining at The Watermark, which is also located at the inn. This lavish dining room is a much sought after venue during peak seasons, offering a full range of delectable gourmet dishes. We each selected a simple breakfast consisting of two eggs, bacon or sausage, as well as toast. 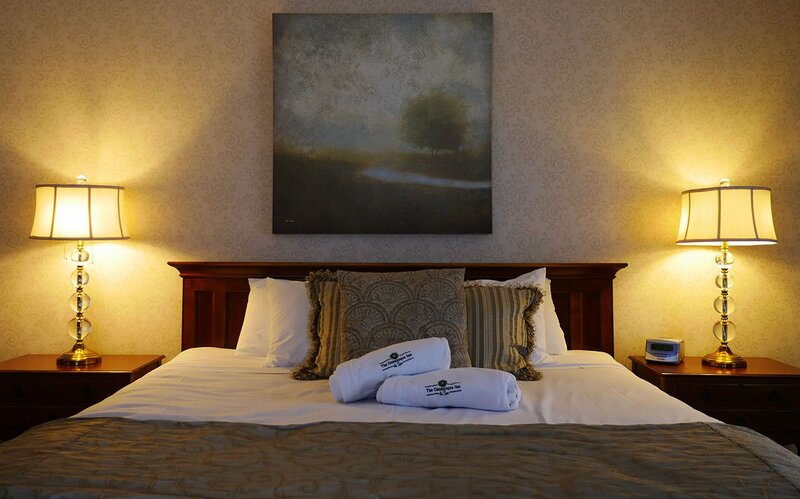 The Watermark offers wonderful views of the waterfront, and The Gananoque Inn’s immaculately kept riverside grounds. In fact, in their endeavours to use only the highest quality ingredients, the Watermark uses herbs and other items grown on-site in the inn’s gardens. Guests will certainly enjoy The Watermark’s vintage decor and bright lighting that presents a fantastic venue for a quiet romantic dinner, or family meal. Our breakfast was delicious and the service equally impeccable. Once we were finished our meal, we headed back to our room so we could relax for a bit before packing up our luggage and heading to the spa. Another of The Gananoque Inn’s unique on-site amenities, is their immaculate spa facility which offers a wide array of services from massages, to manicures, pedicures, waxing, wellness treatments and well beyond. I’m told that there is no better way to relax – and destress than to take a trip to the spa. Personally, I had never been to a spa, nor had I ever received a professional massage in my entire life, so this would be a first for me. Admittedly, I was a tad nervous, and unsure about just what I was getting myself into. Going to the spa is something that never really occurred to me – even though I’ve bought Heidi and her mother spa gift certificates as Christmas gifts in the past. For our visit, Heidi and I would both be enjoying a mini-manicure, as well as a 20-30 minute massage of our choice. Heidi chose a shoulder, neck and scalp massage, as she spends a lot of time lugging her gear bag around while one or more cameras are strapped to her for good measure. I spend copious amounts of time typing throughout the working day, so I decided that a hand, arm and shoulder massage would be just the ticket. We were then shown to the couples massage room which is a wonderfully decorated room complete with a fireplace and side by side massage tables. The scent of aromatic essential oils combined with soft relaxing music and the dim lighting of the room made for a most perfect setting. Our massages were absolutely divine and quite literally melted the stress away. I was particularly amazed by the hand and arm portion of my treatment. As the therapist went about her work, I could feel the various bone and muscle groups in my hands and wrists snap, crackle and pop. Anyone who spends a lot of time typing or even operating power tools would certainly benefit from this sort of therapy. I was also really impressed with my first manicure ever. After butchering my own nails this entire time, I’m now more inclined to go to a professional. Besides, after a good filing and layer of top coat, my nails have never been shinier! 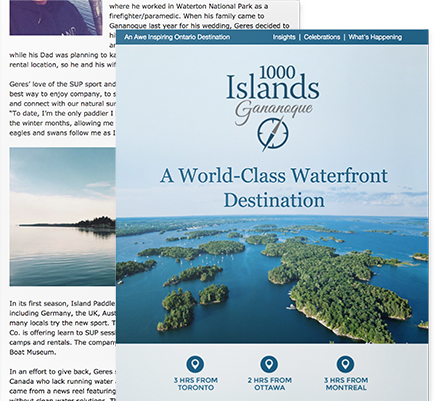 Embrace Autumn in The 1000 Islands, Gananoque! This brings our latest travel feature to a close! Summer may be gone, but there is no shortage of ways to get out there and make the most of the autumn season while it lasts. Thanks for stopping by to read our story! 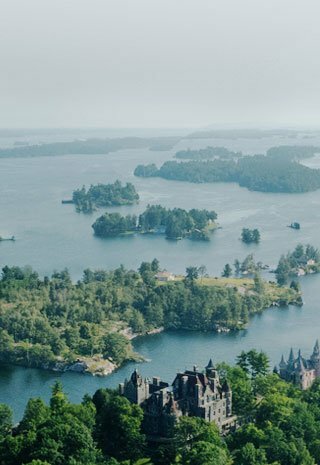 From breathtaking hikes along the mighty St. Lawrence River to luxurious accommodations, decadent dining options and rejuvenating spa treatments – you definitely deserve an escape to Gananoque this fall!